Spectators were speechless as Steven Wilson sang the national anthem in his native language of Lakota at the Women’s National Invitation Tournament Sweet 16 game on Saturday in the Sanford Coyote Sport Center. 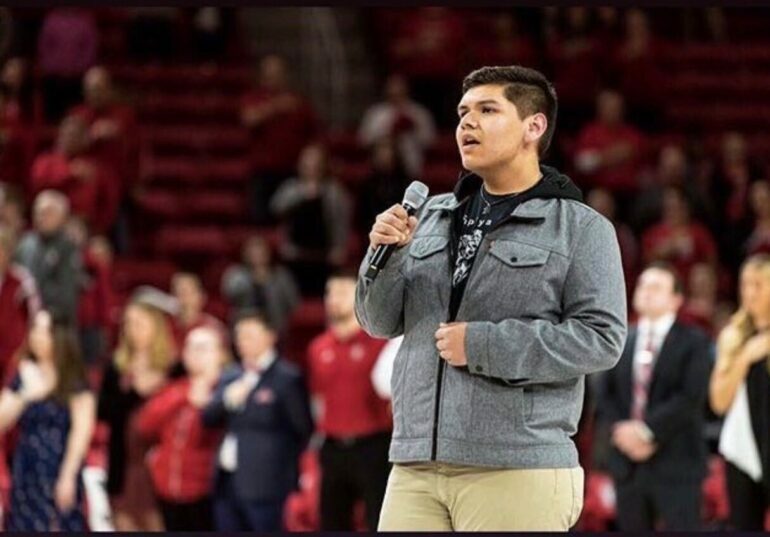 Wilson, a first-year medical biology major at USD, has been singing the national anthem in Lakota since he was a junior in high school and has shared his heritage with people everywhere. After accepting an invite from Joe Thuente, Wilson had the opportunity to sing at the basketball game on Saturday. Wilson was invited to sing the national anthem at a USD basketball game after he sang at a Class A state boys basketball tournament in Rapid City, and the videos people took went viral. Kevin Phillips, a Sioux Falls morning radio host and public address announcer, was at the game and filmed Wilson’s performance. He posted the video on Facebook during the game and it now has well over 750,000 views. Phillips said he enjoyed hearing Wilson sing in Lakota and was happy to share his video with thousands of people. Although he hadn’t met Wilson prior to his performance, Phillips said he was impressed with his performance and excited to see what comes next for him. Wilson started taking Lakota classes in high school and by his junior year, he learned the national anthem in Lakota language. Wilson said even though he knew the language, it was difficult to fit it into the English melody of the national anthem. Once Wilson fully learned the national anthem in Lakota, he performed it for the first time at a home football game at his alma mater, Red Cloud High School in Pine Ridge, SD. Wilson said since this was his first time singing in Lakota, he was full of nerves and anticipation.